Is banning books a thing? Now celebrated annually, Banned Books Week was started in 1982 “in response to a sudden surge in the number of challenges to books in schools, bookstores and libraries,” and its purpose is to “bring together the entire book community — librarians, booksellers, publishers, journalists, teachers, and readers of all types — in shared support of the freedom to seek and to express ideas, even those some consider unorthodox or unpopular” (2018 Banned Books Week website). Banning books — is it a thing? Given there’s an entire week bringing attention to attempts at censoring books in the US, we might jump to the conclusion that tons of people are running around trying to remove books from libraries. But let’s pause and ask ourselves, “I wonder if there’s data that examines US people’s attitudes about removing books from libraries?” Well, as luck would have it, there is! The General Social Survey, or GSS for short, which has been conducted approximately every other year since 1972, tracks hundreds of trends in social characteristics and attitudes over the past four decades. While not a survey of the entire US population, it is a full-probability, national-level sample survey — in layman’s terms, that means you can be pretty confident that the opinions of the group of people surveyed in any given year generally reflect those of the US population at that time. Click on the variable name links above to explore the general trends in attitudes over the years. But wouldn’t personal characteristics influence someone’s attitudes about removing books from libraries? Brett, J., & Campbell, M. E. (2016). Prejudices unshelved: Variation in attitudes toward controversial public library materials in the General Social Survey, 1972–2014. Public Library Quarterly, 35(1), 23–36. Burke, S. K. (2010). Social tolerance and racist materials in public libraries. Reference & User Services Quarterly, 49(4), 369–379. Burke, S. K. (2008). Removal of gay-themed materials from public libraries: Public opinion trends, 1973-2006. Public Library Quarterly, 27(3), 247-264. What does this chart seem to tell us about the relationship of these variables? 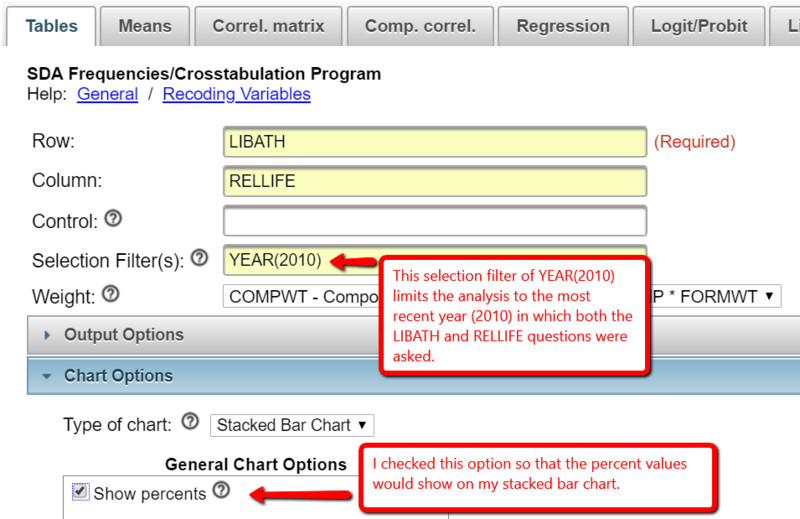 Start at the right side of the chart and focus on the green sections of the bars. As we move from right to left across the horizontal axis from respondents saying they ‘strongly disagree’ to those saying they ‘strongly agree’ with the statement “I try hard to carry my religious beliefs over into all my other dealings in life,” we see a steady increase in the percentage of GSS participants who thought a book “against churches and religions” should be removed from the public library. In other words, this data supports a claim that, generally, the more a person tries to carry their religious beliefs into their everyday life, the more likely they are to say an anti-church/anti-religion book should be removed from the public library. 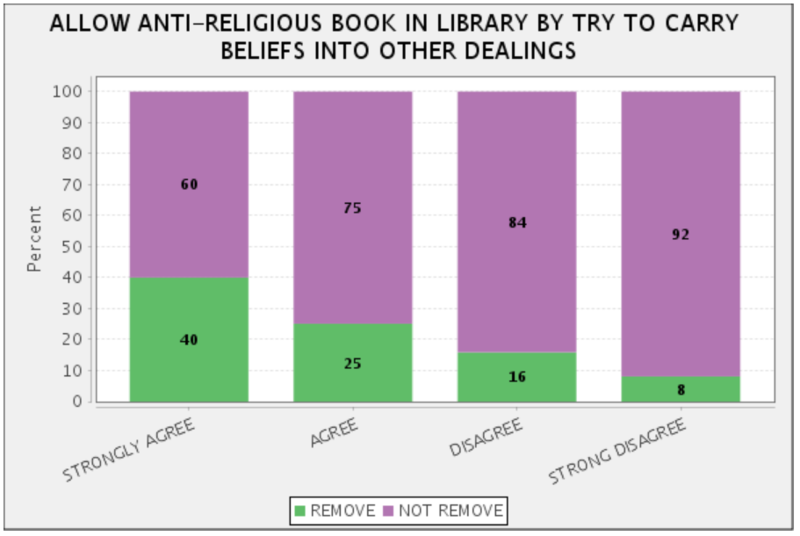 That said, if we focus on the purple section of the bars, we should note that 60% of those that strongly agreed and 75% that agreed with the statement “I try hard to carry my religious beliefs over into all my other dealings in life” did *not* think that an anti-church/anti-religion book should be removed from the public library. So, this data supports a claim that, generally, even if people feel that their own religious beliefs should factor into their everyday life, they are more likely to be tolerant of anti-church/anti-religion ideas being available in public library books than they are to wish that the books be removed/censored. Want to dig into this or other data even deeper? If we downloaded this data into a statistical software package like SPSS, SAS, or R to run tests of statistical significance, we could make more definitive conclusions about the relationship between these two variables as well as factor in other variables. Sound like fun? If so, the Library’s Research Data Services Team can help you find data and learn how to use tools to analyze it. We want to arm you with data for success in your academic life and beyond! This entry was posted in Books, Data Services, Ejournals, For Faculty, For Graduate Students, For Students. Bookmark the permalink.